A team of researchers have revealed the first real image of a black hole. 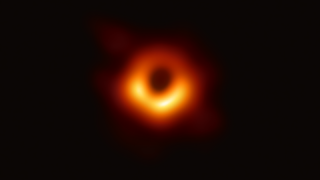 The picture, captured by the Event Horizon Telescope (EHT) shows the glowing accretion disc around the black hole at the center of the Messier 87 galaxy. Until now, our understanding of what a black hole looks like were based on inferences rather than direct observation, but the reality matches up with what astronomers were expecting based on Einstein's theory of general relativity. Material at the event horizon is moving at light speeds, colliding with such force that it creates a huge amount of heat and light. This light is bent and pulled in by the black hole's incredible gravitational pull, creating a dark 'shadow' in the center. The black holes were observed for two week-long stretches – one in 2017 and one in 2018. The image of M87 comes from the first week. "I have to admit, I was a little stunned that it matched so closely the predictions that we had made," EHT team member Avery Broderick, of the University of Waterloo and the Perimeter Institute for Theoretical Physics in Canada, said during today's press conference. Despite its name, the Event Horizon Telescope is actually a global network of eight radio telescopes, co-ordinated using precise atomic clocks. The telescope is also monitoring Sagittarius A, the black hole at the middle of our own galaxy, the Milky Way, but the team reported that M87 was easier to capture. Hopefully images of Sagittarius A will be revealed soon. "We have taken the first picture of a black hole," said EHT project director Sheperd S Doeleman of the Center for Astrophysics, Harvard and Smithsonian. "This is an extraordinary scientific feat accomplished by a team of more than 200 researchers."